The holidays are quickly flying by. I'm so busy that I feel saddened to not have as much time as I wish I could to enjoy every moment. If you, like me, are busy create a quick but stylish hand-crafted card to send this Christmas Season. Created at a fun card making class, I'd love to invite you to Join Us at our fun card making classes. The new Thick Whisper White card stock is a dream! I love our regular Whisper White card stock for a layered look but it can be weak in standing up to the test of time as a card stock base. Here using the new Thicker Whisper White card stock that is 100-lb weight it will stand up to use, abuse and even embossing!! 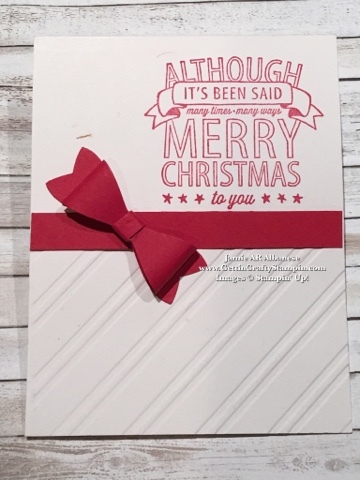 Here the Stylish Lines embossing folder is perfect for this easy and elegant hand-crafted Christmas card. Mimicking the lines of a candy cane - it's perfect for a clean look. Using the Big Shot Die-Cutting Machine it is easier than ever to WOW with a hand-made card. Top off with a bow! So Coco Chanel - she loved a good clean design. The bow is classic and stylish. Here a bow, applied to mimic the lines of the embossing, is easy to do. Use the Bow Builder punch and this tiny bow will delight all who see it. 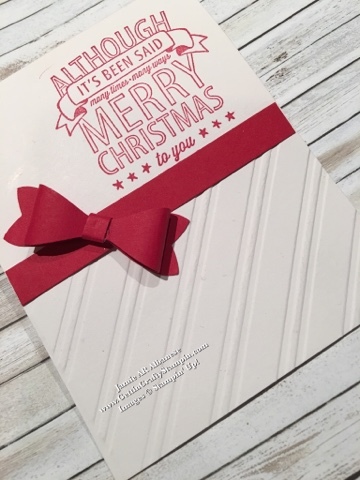 A simple but lovely stamp, bow and stylish stripes combines to create a pretty and easy hand-crafted Christmas card. Join me (in-person or to-go) in card making classes and have fun creating hand-stamped works of love. A simple hand-stamped card can lend to having more time to enjoy the holidays. Merry Christmas! !